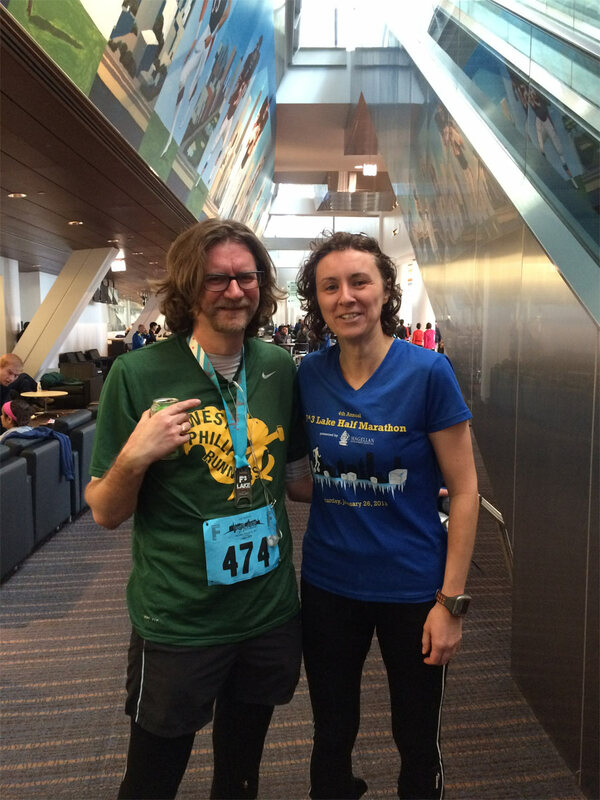 In which I knock TWENTY MINUTES off of last years race time, PR, and realized I could probably have done better. So ... two years ago I was just starting out running. I'd made this deal with Peter Sagal that if I could run 3 miles by January of 2013, he'd run 3 miles with me when I came out to do his book jacket photo. So I worked out like crazy and got to the point where I could run three miles and Peter and I ran and then the next day I watched him run a 13 mile race along the lakefront in Chicago and it was nuts -- it was so cold sweat coming from people's necks froze onto their hair. That's how cold it was. I was like Sweet Barking Cheese! I WANT TO DO THIS NEXT YEAR. 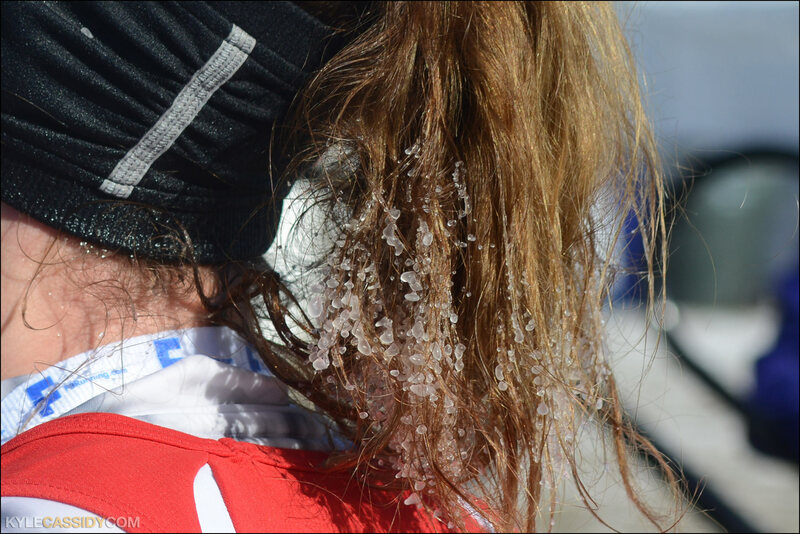 Your sweat, it freezes on your hair. Clickenzee to Embiggen! 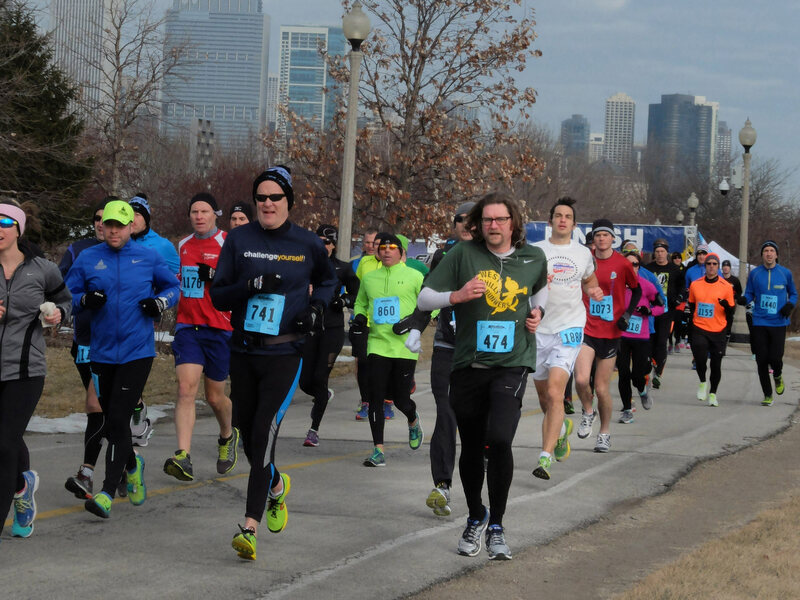 So I ran my posterior off the next year to get in half marathon shape and I went back to Chicago in the freezing cold ran the half marathon in two hours and nine minutes. (Peter ran it in an hour and thirty-two minutes). This year I went back to run it faster. In the intervening year I'd cut my half marathon time down first to 1:57, then to 1:55, and then most recently at the Philly half, to 1:52. My goal this time was to break 1:50 which I suspected I could do because I wasn't killing myself in the Philly half. The fastest I'd run any sustained distance was ten consecutive eight minute and twenty second miles (8:20) for the 2014 Broad Street run which was enough to get me in the top 20% of finishers times, but it's still not fast. My Philly half marathon pace was about 8:40 per mile. And when you're talking about more than ten miles, eeking out a couple of more seconds a mile is really hard. I trained on my own, and with the West Philly Runners, I did speed workouts but still went to Chicago feeling lost and unsure. Unless I'm 10 miles into a long run I'm positive that I can never run that far. I'm filled with self doubt at the beginning of every run, sure that I'll have to stop and take a taxi home. This is mostly always true, despite having run something like 40 half marathons. 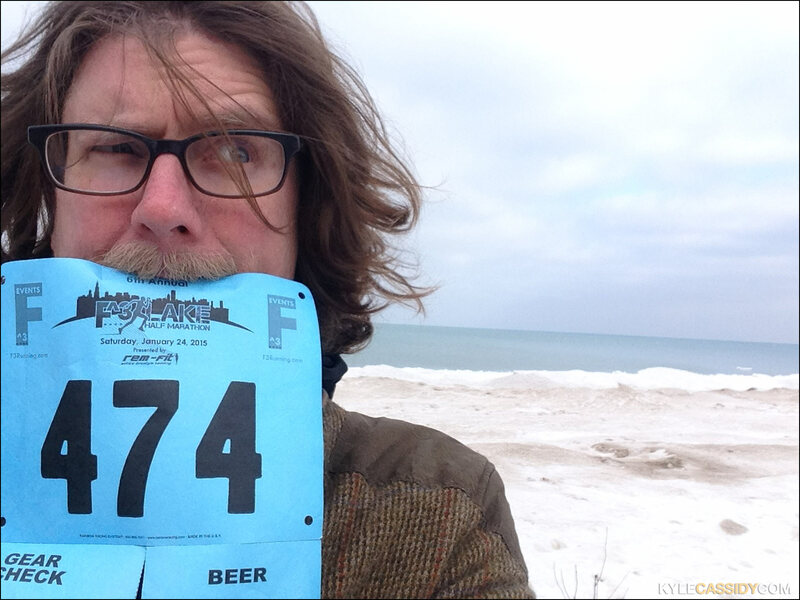 When I got to Chicago it was freezing, really freezing, there was 300 feet of ice out along the lake and my fingers got so numb riding a rental-bike to pick up my race number that I couldn't squeeze the brakes, despite my gloves. The lake, it is frozen. Clickenzee to Embiggen! There are things you know to be true that can be hard to convince yourself of -- like that if you jump out of the airplane the parachute will stop you from dying. One of the hardest things for me at the beginning of a run on a cold day is believing how warm I'm going to be after the first mile. And it required great effort to toss my jacket at the start and run in just a long sleeve shirt with a West Philly Runners shirt over top of it, but sure enough, I was fine after the first mile and positively hot by mile five. 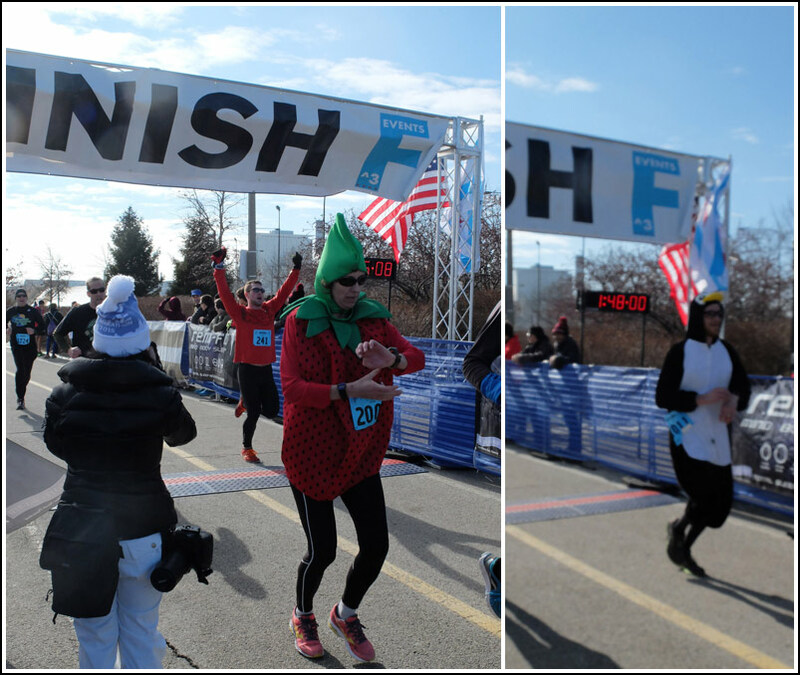 I started out in the 8-9 minute pace corral about three people behind a woman dressed as a giant strawberry and my first goal in any race is not to get beaten by someone dressed as fruit. We started off and I decided to try and keep up with three women who were running together who had obviously been practicing and were keeping a pace like a metronome and we fell into place about 20 feet behind the strawberry. I didn't check my watch until mile six and only then discovered that I was going way too fast (I broke my 10k personal record by two minutes and still wasn't at the half way point) -- they were running sub-8 minute miles, which I'd previously thought was my 5k pace. I let them go and decided to pick a new adversary lest I completely burn out and have to walk back, but I'd done the damage and a series of competitors I picked to keep up with slowly pulled away from me. By mile seven I was running pretty much alone between packs (and then got passed by a guy dressed as a duck). I run. You may embiggen. The only pacing calculation I'd made before the race was that if I was at 1:24 by mile 10 I could break 1:50 in the race and not have to die doing it. At mile 10 my watch said 1:22. At this point I was beat from having run so fast in the beginning and every step was a voice saying "you're not going to PR, you might as well walk a bit" and another one saying "if you push harder you can break 1:50". I was talking to Lindsay after about "what actually hurts when you say it hurts?" and really, while you're running like that nothing hurts it's just uncomfortable. Like you're sitting in an uncomfortable position and you want to do something else -- and running, and a lot of exercise, I think -- is just dealing with discomfort, saying "it's going to be over in 24 minutes, I can do this for 24 minutes" and actually believing it. So I pushed on. I'd have to do a 28 minute 5k, which is 4 minutes slower than the fastest one I've ever done and about two minutes faster than what's become a relatively easy one. So I ground it in, fairly convinced that I wasn't doing my best but also convinced I was exerting "minimum necessary effort". I shot across the finish line at 1:49:46, making a new Personal Record but getting clobbered by the strawberry. 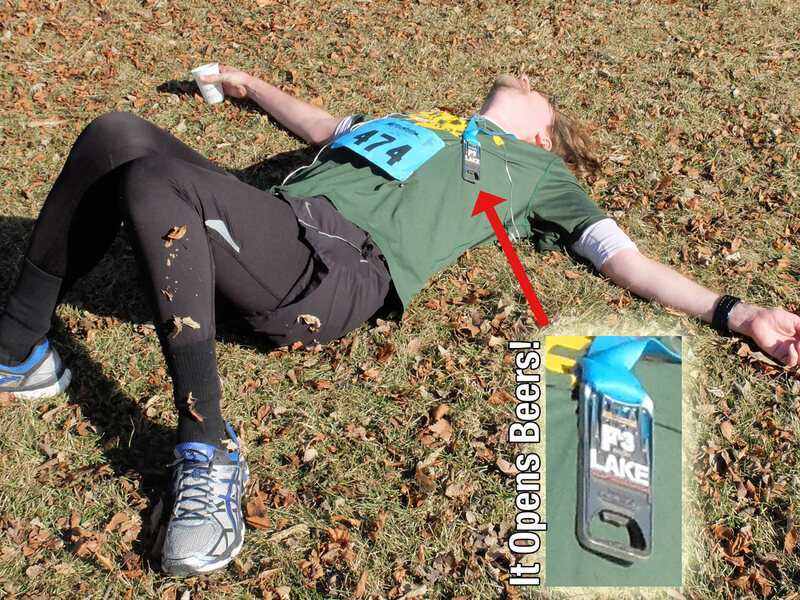 I ran, I died, I got a medal. I was revived. Clickenzee to Embiggen! The strawberry and the duck. Both beat me. The strawberry, it later turned out, was Joanne Singleton, who holds the Guinness Book of World Records' "Fastest Half Marathon Dressed as Fruit (female). You can see her accepting her world record here, so my humiliation was mitigated somewhat. Joanne Singleton, the fastest fruit there is. Ultimately though, unless you're one of about 40 people on earth, it's not about being the fastest -- it's sometimes about being faster than you were before, but truly, it's not about speed and it's not about beating anybody, it's about living longer and dying better. Funny that you have to cause yourself so much discomfort to avoid discomfort -- with "fitness" you're just concentrating your discomfort into two hour intervals instead of spreading it out over the last decades of your life. And hopefully, you pick something that's fun to do, or people who are fun to do it with, because that's what sticks with you, the people, the happiness, the being able to walk up stairs without getting winded -- not the last 26 minutes you'd rather be doing pretty much anything else. So ... I'll be around for the Newbery Awards at ALA Midwinter in Chicago this weekend. I wanted to read at least one of the books that might win, hopefully two. Here's my shortlist. Any advice to help me narrow it down?